Whenever I am looking for the roots of heavy metal, the bands which created our beloved music style and its components, the band I mostly aim for is Judas Priest. "March Of The Damned", a brand new song from British heavy metal legends JUDAS PRIEST, can be streamed in the YouTube clip below. The track is taken from the band's forthcoming studio album, "Redeemer Of Souls", which will be released in North America on July 15 via Epic Records. The CD's title track was made available for purchase via iTunes and other digital service providers on April 29. Said JUDAS PRIEST guitarist Glenn Tipton about the "March Of The Damned" track: "'March Of The Damned' is really one of my favorite songs. It's just simple and straight to the point. It's not really a song about zombies or the walking dead. It also has a reference to all the kids that come to our concerts that march along and can't be stopped. So it's not JUDAS PRIEST and the audience. With all the anthems we've done and all the singing the audience does, it's one and the same thing." "March Of The Damned" has been released to rock and metal radio and is available for purchase via all digital sales providers. 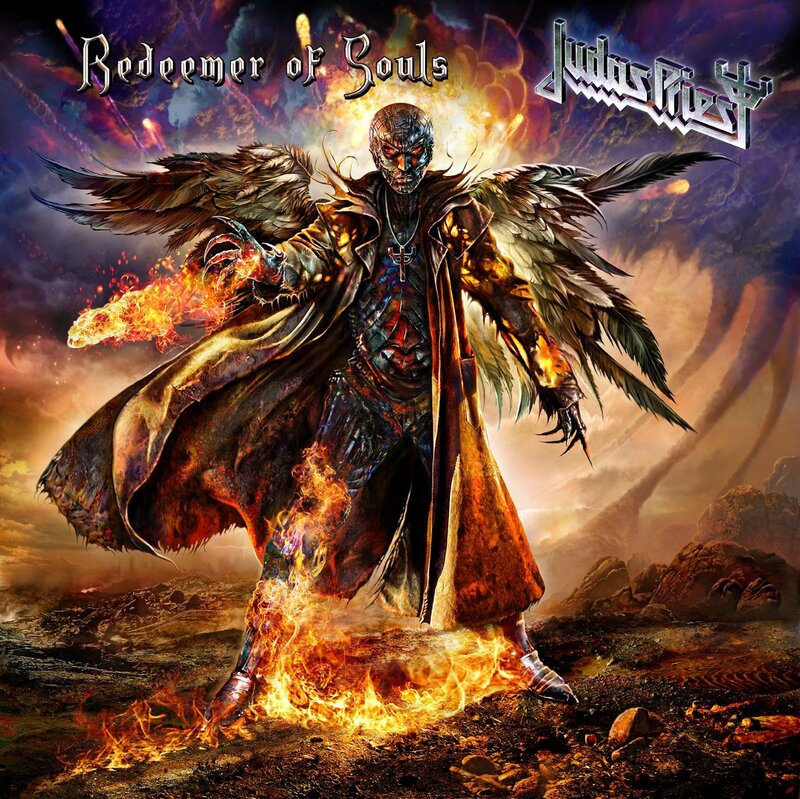 Additionally, pre-orders for the "Redeemer Of Souls" album are now available through iTunes. Speaking to the "Trunk Nation" show, which airs live Mondays from 6 p.m. to 10 p.m. EST on SiriusXM's Hair Nation, JUDAS PRIEST singer Rob Halford stated about "Redeemer Of Souls": "When we finished [the] 'Epitaph' [tour], we just got so buzzed from the fans and the reaction wherever we went. Just to put the 'Epitaph' tour together, which was we tried to put a song from every record into the show, and we were living in the life of JUDAS PRIEST, all those decades, in one show, night after night on the world trek, and I think that really did something to us eternally; as musicians, it should do when you tour. So we realized that this next record really had to be really strong, full of energy, because it's relentless, the tracks are relentless. The energy that you feel off 'Redeemer Of Souls' is replicated in that direction time and time and time again." Asked whether the members of JUDAS PRIEST still feel good about "Nostradamus" six years after the album's release, Halford said: "If you look at bands of longevity, like PRIEST, you see the trail of music that we've left, I don't think we could have probably made as great a record as we have with 'Redeemer Of Souls' if we didn't have 'Nostradamus' as a reference point. It's a stepping stone to the next place. "Every record that we've made, we've tried to give it some distinction, some separate identity. 'British Steel' doesn't sound like 'Stained Class', 'Stained Class' doesn't sound like 'Painkiller', 'Painkiller' doesn't sound like 'Defenders Of The Faith'… So I think everything has its place and has its moments, and we've always fed off these different areas that we've gone into with our metal. So thanks to 'Nostradamus', we've got 'Redeemer Of Souls'." Regarding why there are five "bonus" tracks that are included on the deluxe version of "Redeemer Of Souls" and do not appear on the CD's regular version, Glenn Tipton said: "They are all great songs. The reason they are not on the album is because the 13 that we chose are very consistent with what we wanted to do, which was release an undisputable heavy metal album. The others, they are not lightweight by any chance, but they've got a different feel, a different texture. So it's not a case of trying to rip the kids off and trying to get more money for an extra album, it's just a case of, these five tracks seem to deserve to go on their own CD, and that's what we did." Added Halford: "We didn't want to drop the energy. From the opening thunder-and-lightning on 'Dragonaut' right up 'till the end of 'Battle Cry', it's just full-on, it's relentless. It's great." "Redeemer Of Souls" CD track listing: 01. Dragonaut 02. Redeemer Of Souls 03. Halls Of Valhalla 04. Sword Of Damocles 05. March Of The Damned 06. Down In Flames 07.